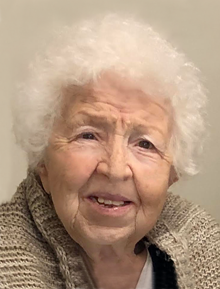 FUSCO, Mafalda (Augellone) Of Revere, formerly of East Boston, passed away peacefully on January 20, 2019. Beloved wife of the late Teodoro Fusco. Loving Mother of John Fusco and wife Mariregis of Stoneham, Terry MacDonald and husband Gary of Norwood and Albert Fusco and wife Fran of Westwood. Cherished grandmother of Alanna, Timothy, Andréa, Michael, Nicholas and Christopher. Sister of the late Angela Silla, Derna Romito, Primo Augellone, Iolanda Marcario, Luciano Augellone. Mafalda, or Muffy, was born to Nazzareno Augellone and Terenzia (Fusco) Augellone in Scanno, Italy on January 11, 1928. Mafalda Fusco married Teodoro Fusco on July 15, 1950, one year later on June 8, they were blessed with the birth of their first son, Giovanni. During the next five years they worked and planned towards their immigration to the United States, where Teodoro arrived first in 1956 to establish residency and employment. In December 1957 Mafalda and son John arrived in East Boston and two years later, on October 10, 1959, they welcomed the birth of their twins, Albert and Terry. She worked as a seamstress until her retirement. Together with Teddy, they arrived from Italy with nothing but a strong will and determination to provide their family with a better way of life, a roof over their head and especially the education that they always desired but their families could not afford. Their children graduated from college without loan debt. Mafalda turned to St. Anthony on a regular basis for spiritual strength. She loved sharing with her children stories of her parents and life in Scanno, but her real expression of love for her family was her home cooking. Whether she was providing a five course meal or packaging-up some homemade cookies, pizzelle, fritelle, etc. she was always GIVING. Her grandchildren brought her the most joy in her later years, treating each with equal abundance of love and kindness that was seemingly endless. Family and friends will honor Mafalda's life by gathering on Saturday, January 26, 2019 from 8:30-10:30 a.m. at the Ruggiero Family Memorial Home, 971 Saratoga St. (Orient Heights) EAST BOSTON immediately followed by a funeral procession to St. Anthony of Padua Church, 250 Revere St., Revere, for a Funeral Mass in celebration of Mafalda's life at 11:00a.m. Services will conclude with Mafalda being entombed in Holy Cross Cemetery, Malden. In lieu of flowers, donations in Mafalda's memory may be made to the Italian Home for Children, 1125 Centre St., Jamaica Plain, MA 02130.